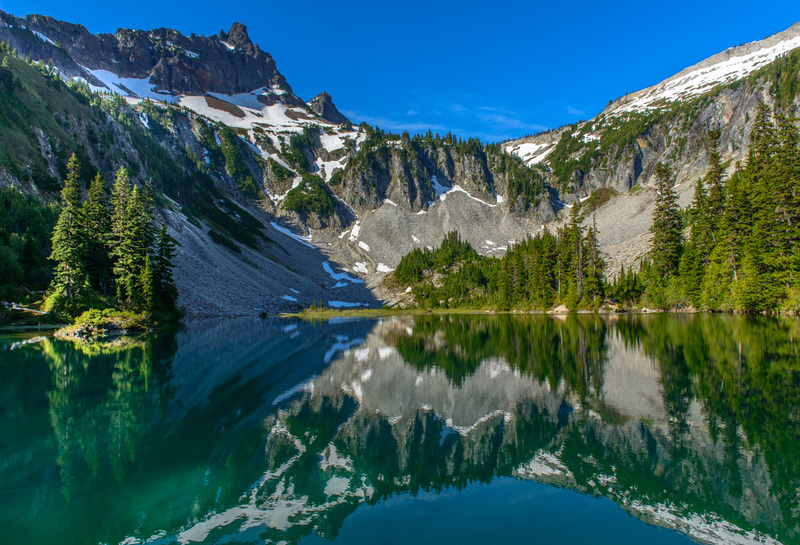 Located in the Tatoosh Range within Mount Rainier National Park, Snow Lake resides in a scenic basin below Unicorn Peak. The saddle in the center of the photo is the primary access point leading to the summit of Unicorn Peak. Camping at Snow Lake is by reservation only and difficult to obtain. So I had to get up very early in order to make the 3 hour drive and 1 hour hike to photograph the lake in early morning. Funny though, just as I was setting up for the shot a family of 4 popped in and stood in front of my camera for about 10 minutes before wandering off. Patience, tolerance and a polite attitude won the day. Nikon D800, 24-70mm, F8, 3 image HDR composite, ISO 100.